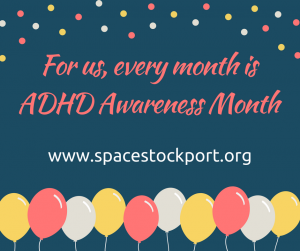 SPACE Stockport is a support group for parents and carers of children and young people in the Stockport area with Attention Deficit Hyperactivity Disorder (ADHD) and associated conditions. 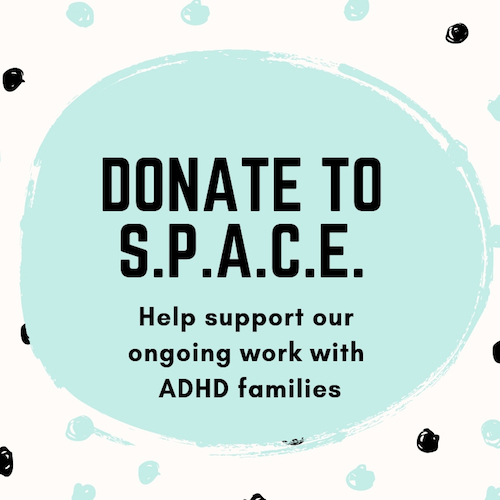 The SPACE committee members are all local parents, who have children with ADHD. We hold regular meet ups, which are an opportunity to talk to other parents who face the same challenges, in a relaxed and informal way. Attention Deficit Hyperactivity Disorder (ADHD) is a neurobiological condition which is commonly characterised by inattention, hyperactivity and impulsivity. ADD (Attention Deficit Disorder) is commonly characterised by inattention and impulsivity. The term Attention Deficit can be misleading as it suggests that those with ADHD / ADD have a lack of attention, when the issue is usually that they have inconsistent levels of attention and difficulty controlling where it is directed. At one time ADHD was considered to be a condition which only affected male children. This is now known to be incorrect, but unfortunately the stereotype of unruly little boys continues to affect the diagnosis of girls and adults, particularly those without hyperactivity. There is a lot of misinformation about ADHD which can be confusing, especially for those with a recent diagnosis. Here at SPACE we provide helpful information which allows parents to make informed decisions and signpost useful services. 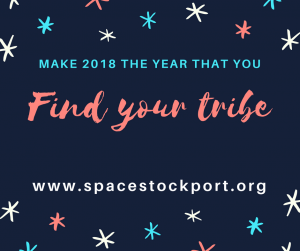 SPACE Stockport is a registered children’s charity and there is no charge for parents or carers to attend our monthly meet ups, join our online community or attend guest presentations. What is ADHD on Biteable. Make 2019 the year that you find your tribe. 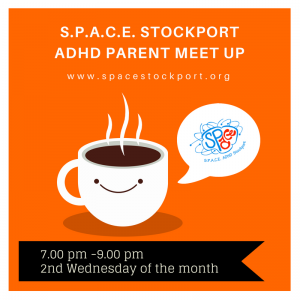 SPACE Stockport ADHD group has a monthly meet up at a local coffee shop in Stockport called Funky Monkey. If you are a parent or carer of a child with Attention Deficit Hyperactivity Disorder then you are very welcome to join us. In addition to our website we also have a Facebook page, a Twitter account and a blog. Our Facebook page includes regular posts about ADHD and includes Facebook posts from other support groups or organisations that share useful information. We also have a closed Facebook group where comments are only visible to other group members. This year the team from SPACE Stockport held our first conference: The World of ADHD According to S.P.A.C.E. It was an interesting and informative day for parents and carers of children with ADHD and also professionals working with them. If you would like to receive emails from the SPACE team, please subscribe to one of our mailing lists. The next meet up for parents and carers of children and young people with ADHD is on April 10th from 7.00 pm.